Chicago got a measure of revenge following a Friday OT loss in a 2-1 victory over New York. NEW YORK — Scott Darling is more comfortable in his second full NHL season and he’s been coming up big for the Chicago Blackhawks with starting goalie Corey Crawford out. Darling stopped 33 shots, Artem Anisimov scored the tiebreaking goal late in the second period and the Central Division-leading Blackhawks beat the New York Rangers 2-1 on Tuesday night. Darling has started the last six games while Crawford has been recovering from an appendectomy. Darling has been stellar over the last four games, allowed just three goals on 116 shots while helping the Blackhawks go 3-0-1. The Rangers had some chances in the final minutes, but Darling stopped Mats Zuccarello’s slap shot with about 3 minutes to go, and then a tip-in attempt by Jimmy Vesey less than a minute later. Trevor van Riemsdyk also scored, Artemi Panarin had two assists and Anisimov had one as Chicago got even with New York following a 1-0 overtime loss at home to the Rangers last Friday. Jesper Fast scored for the Rangers and Antti Raanta, starting for the fourth straight game, made 24 saves. Raanta had won three consecutive starts, including shutouts in the last two. New York had won four of its last five. Blackhawks captain Jonathan Toews was activated from injured reserve earlier in the day after missing nine games with an upper-body injury. Anisimov put Chicago ahead for good with 1:09 left in the middle period, taking a centering pass from Brian Campbell in front and firing it past Raanta for his 13th goal. After a scoreless first period, Chicago got on the scoreboard at 5:18 of the second as van Riemsdyk took a pass from Panarin and wristed it past Raanta for his first of the season. It ended Raanta’s shutout streak of 176:22. The Rangers tied it less than 3 minutes later when Fast, standing at the left side of the net, batted the puck out of the air for his third at 8:15. Vesey had a chance for the Rangers on a rush minutes before Chicago’s goal, but Darling made a nice pad save on his attempt. “He made some key saves as the game went on,” Blackhawks coach Joel Quenneville said. NOTES: Toews had four goals and eight assists in 21 games before he was injured in Chicago’s 2-1 loss at San Jose on Nov. 23. The Blackhawks were 5-2-2 in his absence. The 28-year-old center has no points in his last six games, and just two assists in his last nine. … Campbell’s assist on Anisimov’s goal was his 16th assist and 20th point in 40 games against the Rangers. 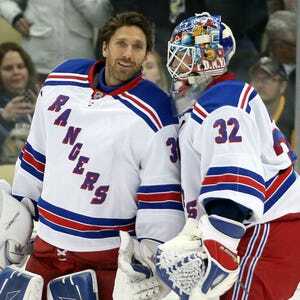 … New York starting goalie Henrik Lundqvist was the backup in a fourth consecutive game for the first time in his career. … The Rangers were without D Ryan McDonagh due to an illness. He was replaced in the lineup by Adam Clendening. … Rick Nash missed his fourth straight game due to a groin injury and Rangers coach Alain Vigneault was optimistic about getting Nash back soon. Blackhawks: At the New York Islanders on Thursday night in the middle game of a three-game trip. Rangers: At the Dallas Stars on Thursday night in the opener of a two-game trip.